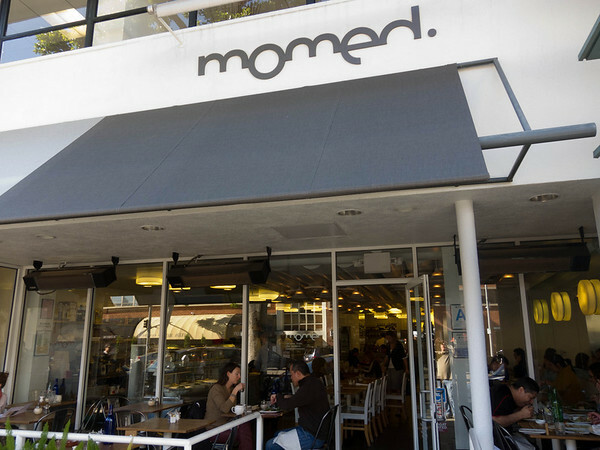 Rating: Interesting, and tasty modernized Middle Eastern. I met a friend here for lunch. I would have to say at it’s core this place is closest to Lebanese, but everything is very modernized for the contemporary Beverly Hills crowd. That being said, it all tasted really fresh and delicious. 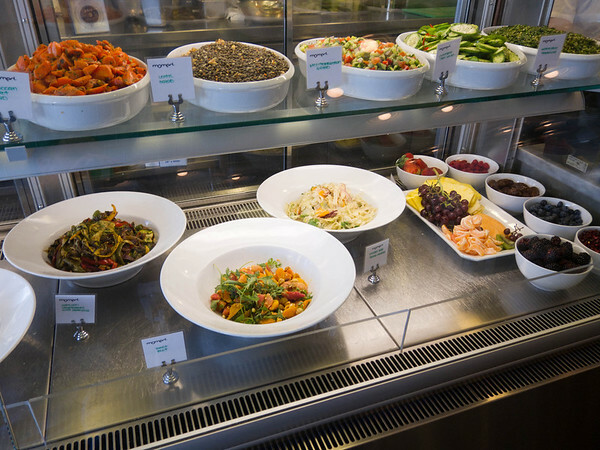 A lot of the mezza/salads are on display. As you can see, they look pretty good. We ordered a three “salad” plate with left to right. 1. Humammara, roasted red pepper, walnut and pomegranate. Really nice rich flavor here. 2. 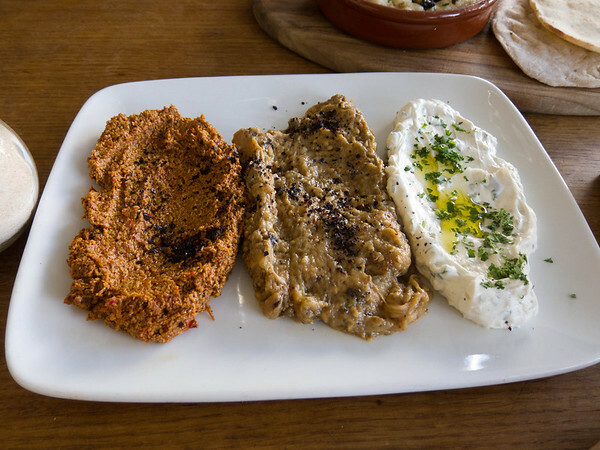 Spicy eggplant, oven roasted eggplant with tahini and Urfa chili. Not very spicy, but great texture. 3. 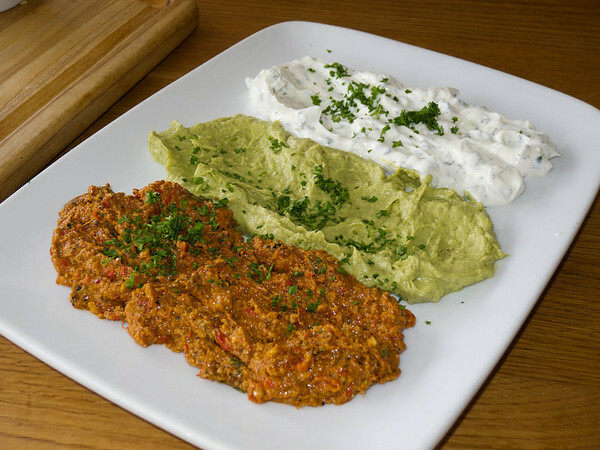 Tzatziki, cucumber and yogurt dip. A fine example of the type, and I like the type. 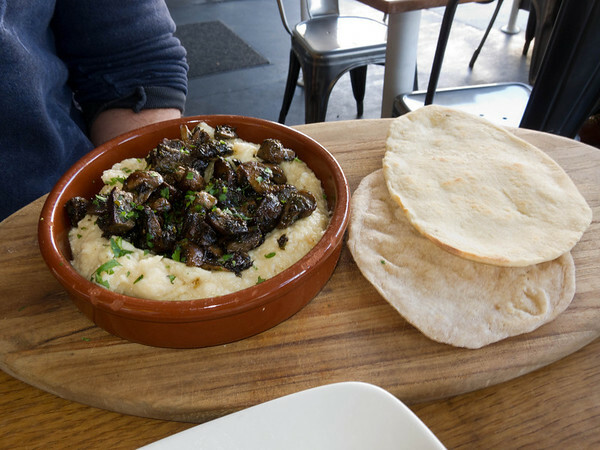 Parsnip hummus with oven-roasted wild mushrooms. The parsnips gave this hummus the texture of very light and fluffy mashed potatoes. It was pretty darn awesome though, and nicely warm. All these dips were really sold by this most excellent warm homemade pita. This was no “tear open the supermarket bag” pita. Soft, warm, chewy. 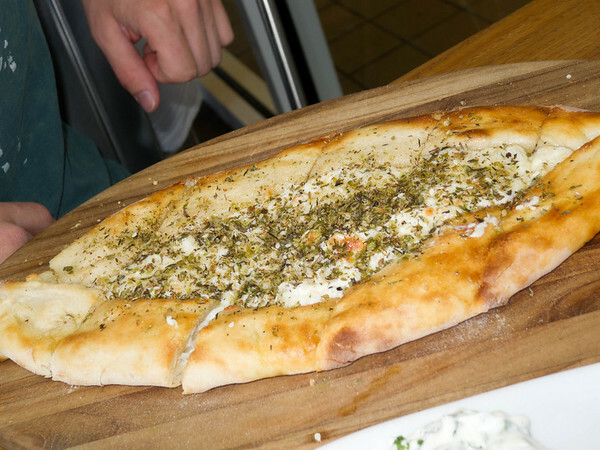 They call this a “pide” (traditional flatbread). 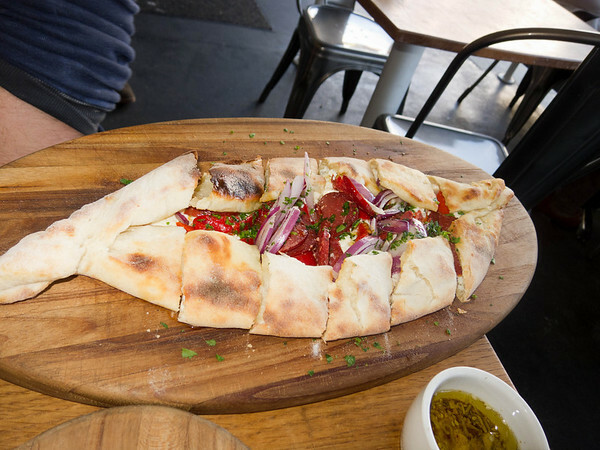 Basically like a Naan crossed with a calzone or strombolli. This one is stuffed with “Ohanyan spicy soujuk sausage, red onions, piquillo peppers and akawi cheese.” I mention the strombolli because that is what this reminded me of: a really good fresh version of one of those pizza dough, pepperoni, and cheese rolls. The sausage leaked off a good amount of grease, but it was good. 2. Avocado Hummus, like a cross between hummus and guacamole! 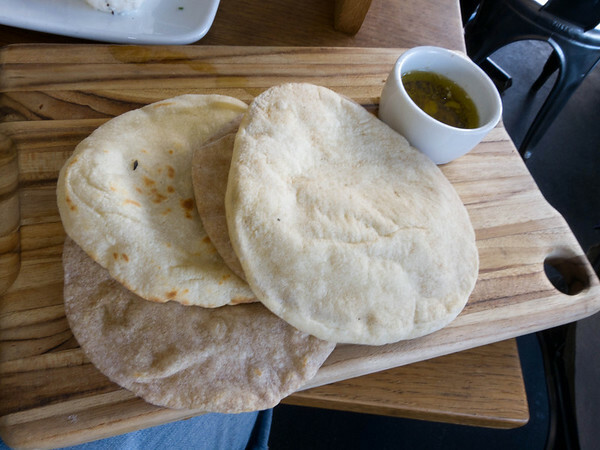 A different flatbread. Hallomi and akawi cheeses finished with Za’atar. Very nice and cheesy, with interesting and exotic flavors. Lighter than the sausage one for sure. 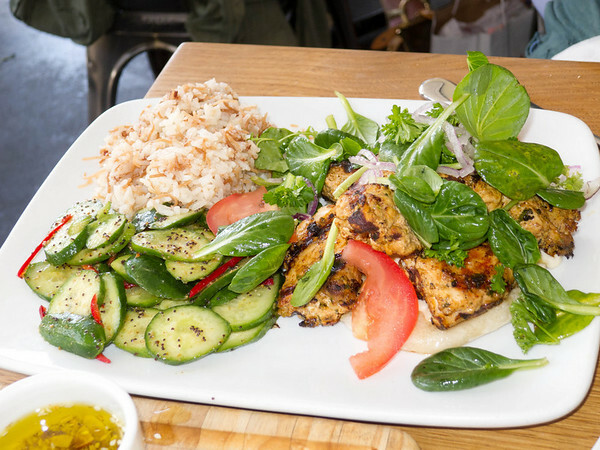 Yogurt-marinated chicken breast kababs with rice pilaf and marinated Persian cucumbers with chili and poppy seeds. 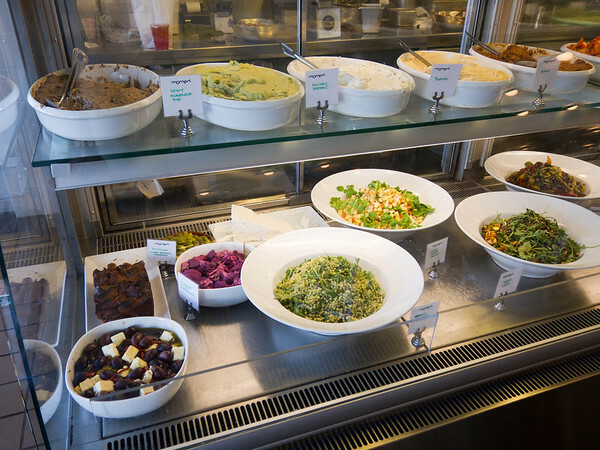 This entry was posted in Food and tagged Beverly Hills California, Cooking, Eggplant, Fruit and Vegetable, Humammara, Hummus, Lebanese cuisine, Middle East, Momed, Naan, Pita, Red onion, Restaurant, Restaurant Review, Salad, side dishes, Tzatziki, vegetarian, Şanlıurfa. ← Machete – The best B-movie ever?